A "national group" of musicians and performers were gathered to frame the unique voice of the internationally established soprano, Hristina Andreou, in a tribute to Rebetika songs. 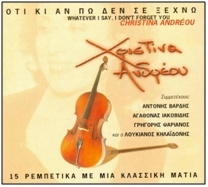 This is an album which includes 15 memorable songs of Tsitsanis, Vamvakaris, Mitsakis, Hiotis and many other significant Greek composers from inside the Rebetiko field, orchestrated by Giorgos Niarhos and Stathis Oulkeroglou. Next to Hristina Andreou, Antonis Vardis, Agathonas Iakovidis, Loukianos Kilaidonis and Grigoris Psarianos.